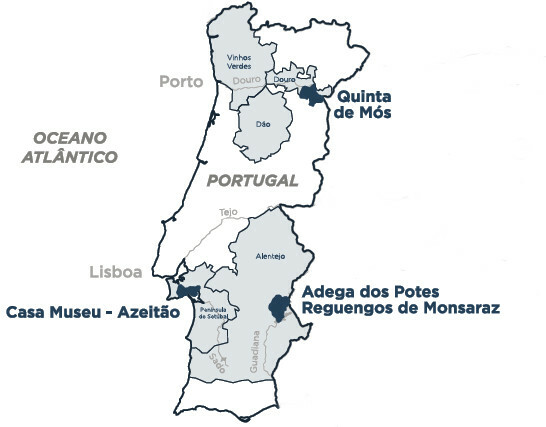 With the purchase in 1986 of Casa Agrícola José de Sousa Rosado Fernandes, whose property is Herdade do Monte da Ribeira, José Maria da Fonseca fulfilled a long-held dream. This was to produce an Alentejo wine on an old and prestigious estate (wine has been made here from at least 1878), using traditional winemaking techniques. In the centre of the picturesque town of Reguengos de Monsaraz, you can visit one of the world’s most unusual wineries, where the José de Sousa, José de Sousa Mayor and J wines are produced, as are Montado wines. 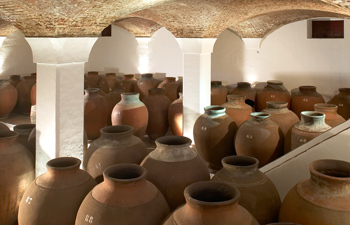 Keeping alive a tradition initiated by the Romans over 2000 years ago, the José de Sousa winery is equipped with 114 clay amphorae, a fermentation method as rare as it is old. The old cellars are below ground level and contain the urns and two open presses for treading the grapes. There is also a new winery equipped with 44 stainless steel vats and all the essential technology for making red and white wines. This is the perfect place to witness the marriage of old and new and to learn more about some exceptional wines.